The Philadelphia Flyers are a two-time Stanley Cup champion winning a two-peat in 1974 and 1975. You can sometimes find replica Flyers Stanley Cup rings on eBay--and occasionally the real deal sold in major auctions. The Flyers were part of an NHL expansion in 1967 and were the first team to win the Stanley Cup outside of the Original Six. This was even with the restrictive rules that kept all major talent with the league's first franchises. The Flyers have an all-time winning percentage of .578, which is only second to the Montreal Canadiens. The Flyers shed with their inferior status “extension team” label after the start of the 1972 season when they were given the nickname “Broad Street Bullies” by the Philadelphia Bulletin. This came after a brawling game with the Atlanta Flames. Their rough and tumble ways continued through into the 1973-1974 season and led to a season record of 50-16-12. The Flyers swept through the playoffs beating the Flames in four and the Rangers in seven. They would eventually face the Boston Bruins and win in six, bringing home their first Stanley Cup and earning their first Flyers championship ring. The Flyers went 51-18-11 for the 1974-1975, which was the best record in the league. Philadelphia swept the Maple Leafs in the second round of the playoffs, after earning a first round bye. They faced the New York Islanders in the third round and beat them in seven games, setting up the Stanley Cup Finals match against the Buffalo Sabres, which Philadelphia would take in six games and win their 2nd straight Flyers Stanley Cup ring. 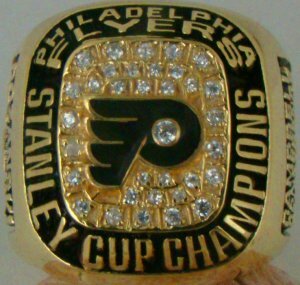 The only three replica Flyers Stanley Cup rings that have sold on eBay in recent weeks are those representing the 1975 season. It is crafted out of a jewelers alloy and plated in 18K gold. It has lots of sparkling CZ’s with the team logo on top in black enamel. They are usually available for between $100 and $200. Keep checking the links below to see what's available now. RARE PHILADELPHIA FLYERS STANLEY CUP CHAMPIONSHIP 2 Ring Set w/ Display Box USA!